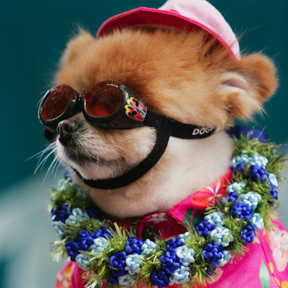 Weekend Scene » Peppy, a 9-year-old Pomeranian, was dressed as a beach boy yesterday at the Hawaii Doggie Bakery's "Howl-O-Ween" canine costume contest at Ward Warehouse. Several isle schools add accountability to parent meetings. An isle writer pens a mystery set on Oahu's North Shore. The loss to rival Fresno drew fewer fans to Halawa than any other game in the Jones era. Ann Worth makes a lot of stops all over the world to recruit grad students for HPU. The City Council wants to make its own rules on how open its actions will be to the public.